Ground Penetrating Radar Systems (GPRS) was requested on site by a general contractor to perform a Ground Penetrating Radar (GPR) scan at the Akron Children’s Hospital in Akron, Ohio. 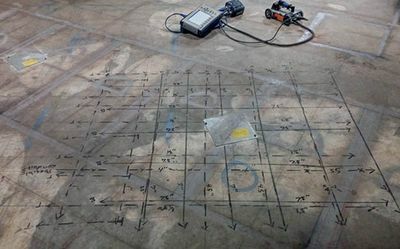 The contractor needed to know where the top and bottom rebar were for multiple locations on an elevated slab where core drilling was to be performed. GPRS also located an electrical conduit that could have been cored through in the concrete slab. The contractor was told there was no conduit in the slab. Call GPRS before you saw cut or core drill concrete and we will keep you safe! GPRS uses a Geophysical Survey Systems Inc. (GSSI) SIR-3000 Radar unit. 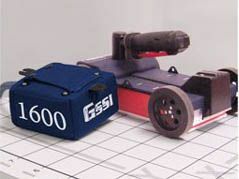 This is the most advanced GPR available. It allows for on-site interpretation, as well as stores data for later processing. This equipment is self-calibrating, allowing more precise depth and location measurements. This antenna allows data collection to a maximum depth of approximately 18”, depending on concrete conditions. This is an electro-magnetic tone locating device manufactured by Radio Detection. 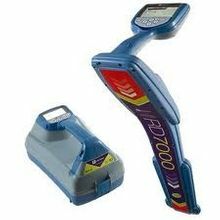 This specific model detects live power and RF signals underground, allowing us to locate electrical or telephone lines even if they are below the minimum size requirements to be detected by GPR. It also allows us to detect utilities via induction or conduction with an exposed or known surface of the utility.